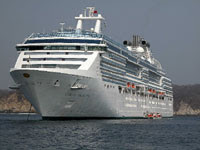 To find great deals on cruises aboard the Coral Princess head to cruise sale finder at http://cruisesalefinder.com.au. ... The document was aboard Coral Princess to give passengers the unique opportunity to view the only traveling copy of the Declaration of Independence. This rare document is being showcased to more than 17,000 passengers aboard all eight Princess ships visiting Juneau during Independence week, July 1-8.